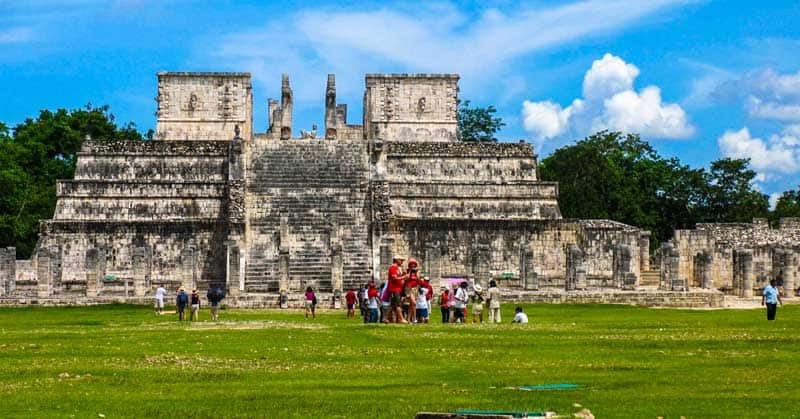 Off the beaten path adventures with a twist of history! Quebec is a winter paradise — especially for those of us who love snowmobiles. 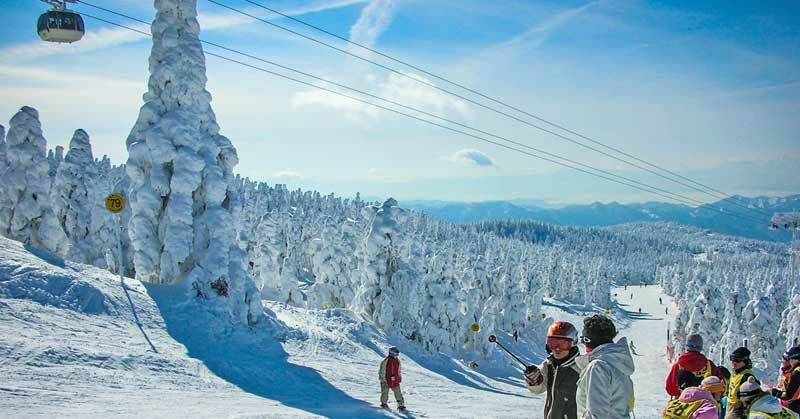 This Eastern Canadian province has thousands of miles of groomed trails that stretch from the shores of the St. Lawrence Seaway to the Upper Laurentians to Gaspe, up against the Maritime provinces. 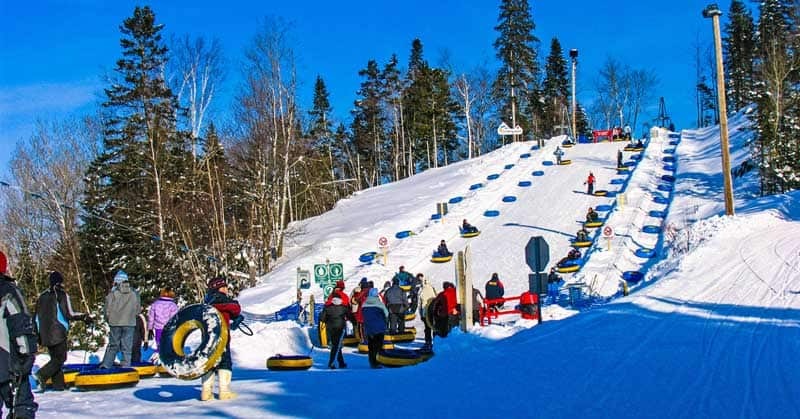 Since the snowmobile was born in the small French town of Valcourt, Quebec, in 1922, it’s no wonder that the machine has become an integral part of winter fun. Snowmobiling through hills in Gaspesie Region of Quebec. 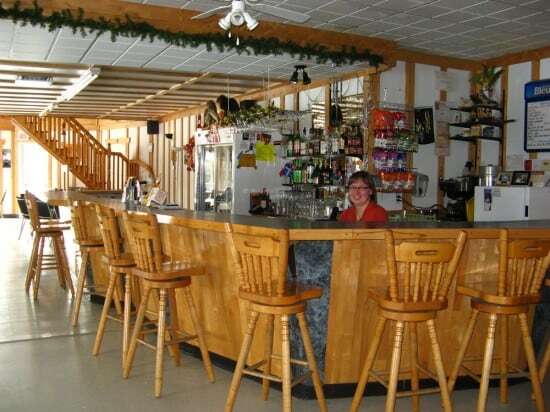 Indeed, we found Quebec the ideal location for a backpacker snowmobile trip, where you load everything on the snowmobile and set off to become an adventurer. In fact, I packed my laptop into the snowmobile gear bag and David and I spent five days covering twelve-hundred miles of spectacular scenery. The destination? 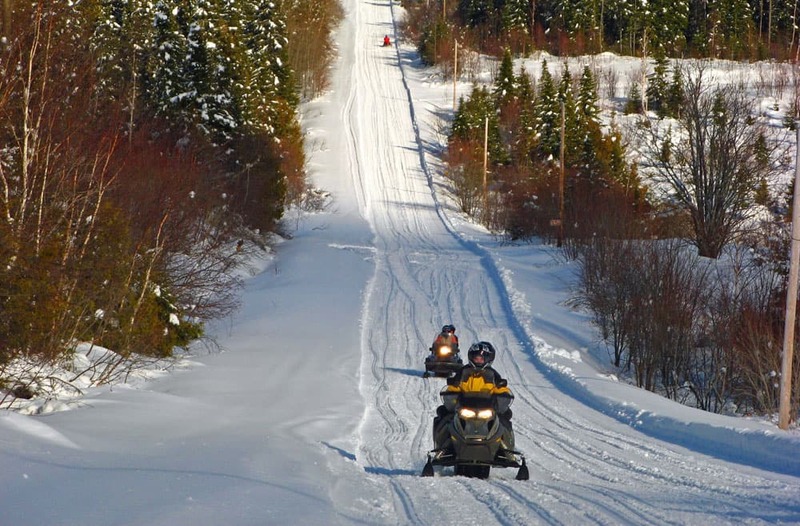 The Bas-Saint-Laurent – Gaspésie Snowmobile Tour. 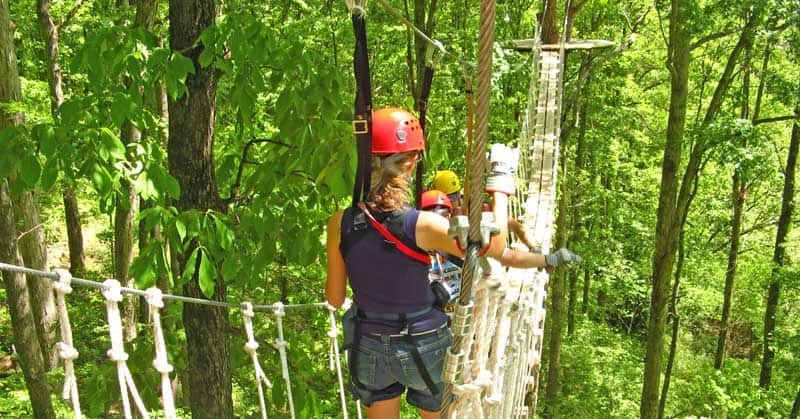 It took us from incredible forests right to the dizzying heights (for me anyway!) of the Chic-Choc Mountains, which are a continuation of the Appalachian Mountains. There are plenty of snowmobile rentals to get you set up with whatever gear you need in all parts of Quebec. For us, the trip would have been 2000+ miles of driving, so we certainly didn’t plan to tow the trailer that far. We had a guide for the trail part of our trip, however we found the trails had excellent signage, so getting to where you’re going isn’t a problem. While it may sound strange to say the trails all led somewhere, it’s nice to know there are a number of places along the way to make fuel stops and get a hot drink and great meal. And getting there was easy–yes, we had a wonderful guide, but trail signage was frequent, explicit, and easy-to-follow even if French wasn’t your first language. 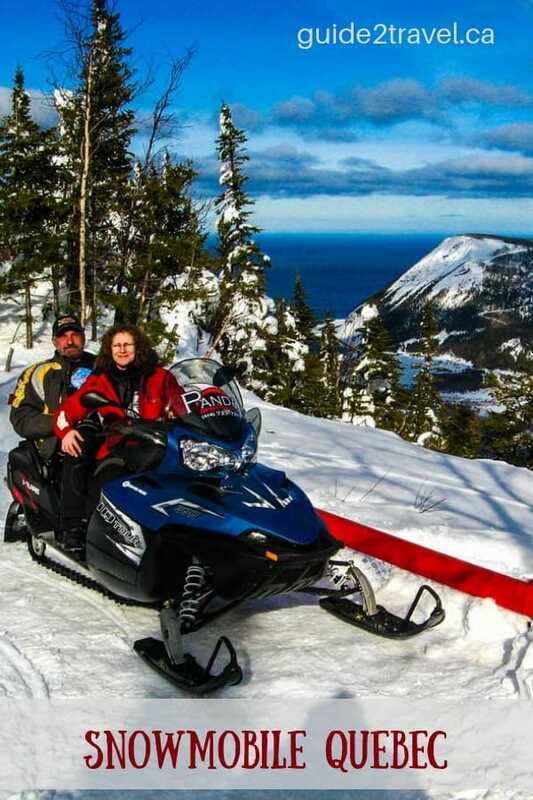 Linda Aksomitis and David Aksomitis at the top of the mountains in Quebec on the snowmobile trail. The trail system itself in Quebec is excellent–some of the best I’ve snowmobiled. One thing that was new to me, however, was the law about having–and using–rear-view mirrors on your snowmobile. 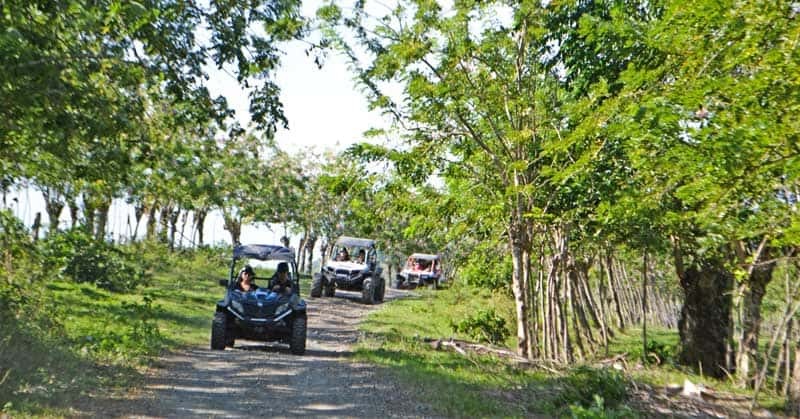 It took awhile to remember somebody could be coming up and whizzing past you on the smooth, smooth trails. 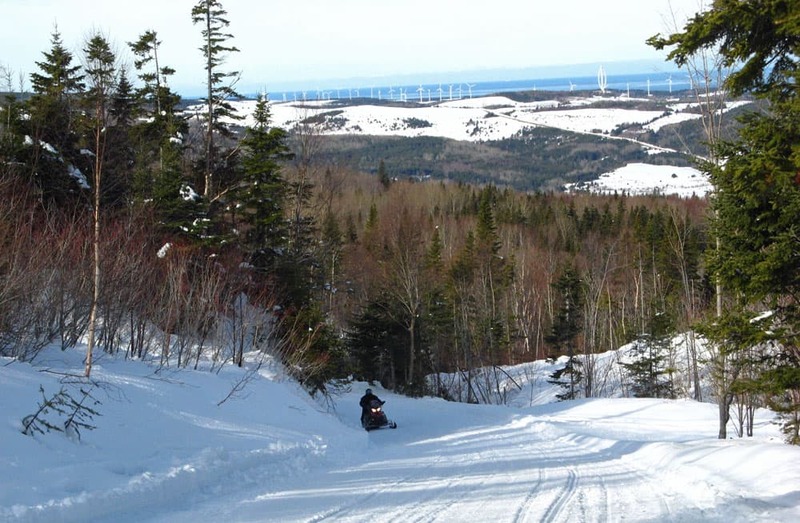 Trails in Gaspesie presented a wide range of terrain for sledders. 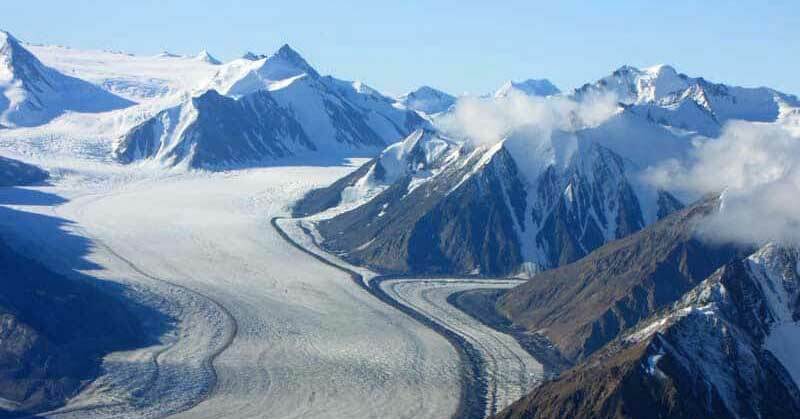 While there were lots of mountains to climb, there were also plateaus and valleys and forests and rivers and bridges. In fact, I crossed about 20 times more bridges snowmobiling in Quebec than I’d ever crossed before in my life! Bombardier’s first garage, which was moved to the museum location in Valcourt. Of course, no snowmobiler headed to Quebec should miss visiting the birthplace of J. Armand Bombardier in Valcourt, Quebec, or the Bombardier Museum. Bombardier invented his first snowmobile in 1922 as a fifteen-year-old mechanic, but it was later, in 1937, that he started selling multi-passenger snowmobiles. His assembly line snowmobiles, the modern rider-over-tunnel style, were prototyped in 1957 and produced in 1959. Officially, the Bombardier museum is called the The Museum of Ingenuity J. Armand Bombardier. 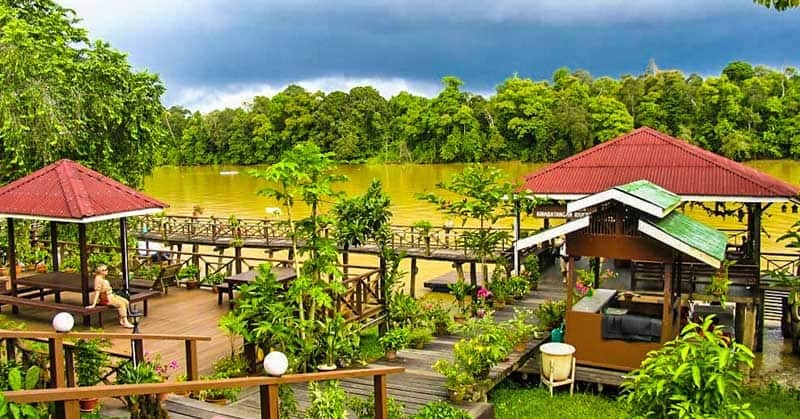 It has just been through extensive renovations, reopening in 2016 after an 18-month, $14 million total renovation. Our tour was fascinating, but then again, we’d ridden many of the snowmobile models on display when they were new! We also toured the Bombardier plant–tours must be pre-arranged (see the link below). 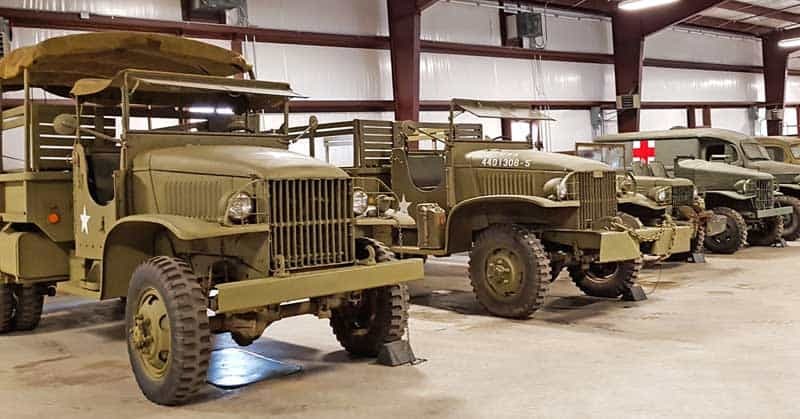 The only downfall to it was that we visited in the winter, and personal watercraft were on the assembly lines, rather than snowmobiles. 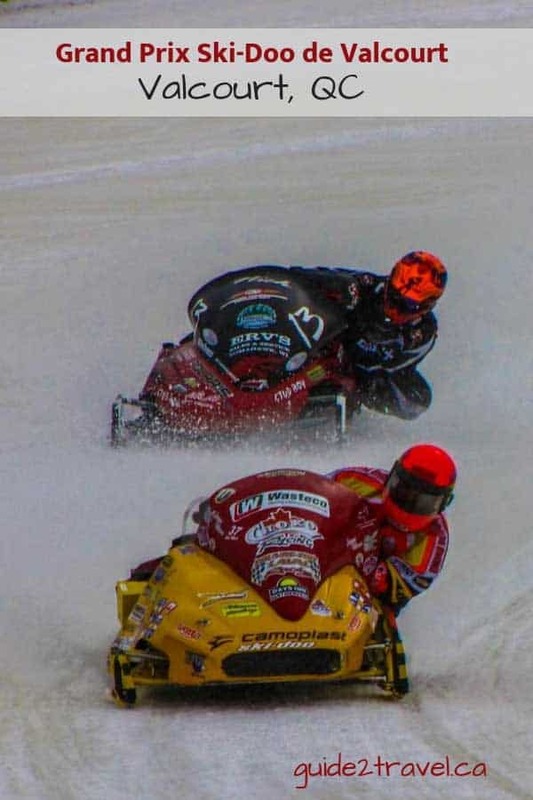 Two snowmobiles at the end of a race on a snowy day in Valcourt, Quebec, at the Grand Prix Ski-Doo de Valcourt. We’ve been lucky enough to visit nearly all of the most historic snowmobile race tracks in North America. 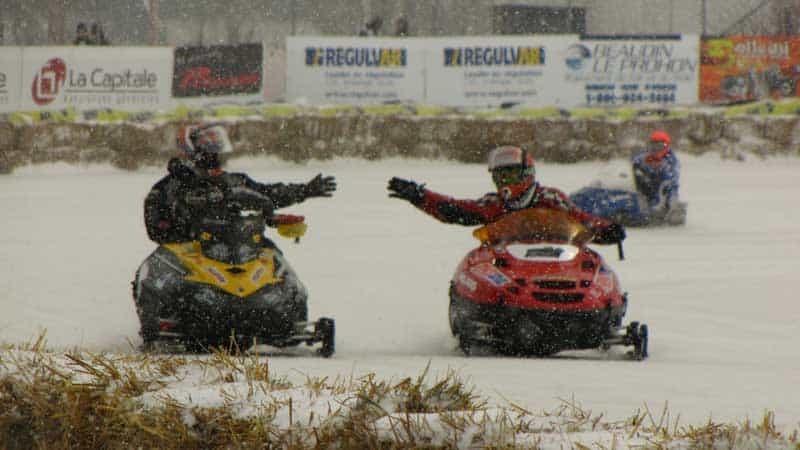 So, attending the Grand Prix Ski-Doo de Valcourt was high on our list of must-do events when planning our snowmobile trip to Quebec. Valcourt’s race event started in February, 1983. Back then, it was known as the Festival International de la Motoneige (FIM). It’s a great venue to check out all types of snowmobile racing, from snocross to ovals. 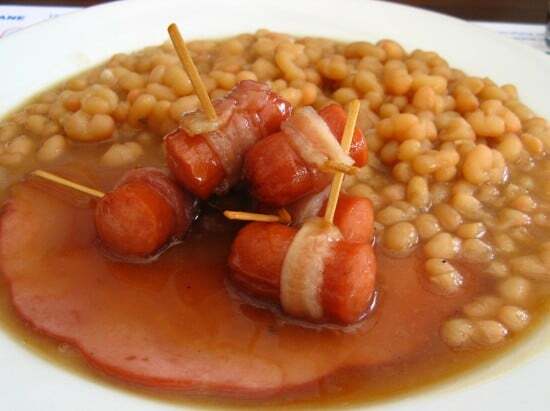 A full “maple” flavored meal (ham, baked beans, and cocktail sausages in maple syrup) at a Quebec sugar shack is served at the Auberge La Pente Abrupte. Maple syrup is as Canadian as the maple leaf on our flag–in fact, they’re two of the top iconic symbols for the great white north that I love, especially in the winter. Where we live on the prairies we do have a few Manitoba maple trees, however maple syrup isn’t an industry as it is in Eastern Canada where they have the deep, moist fertile soils required by the other nine maple varieties found in Canada. Since our snowmobile trip through Quebec’s La Haute-Gaspesie region was in March, the spring thaw had begun and the sap had started to run. I was thrilled to discover we could visit a sugar shack right on the snowmobile trail! Sugar shack – Auberge La Pente Abrupte dining room. 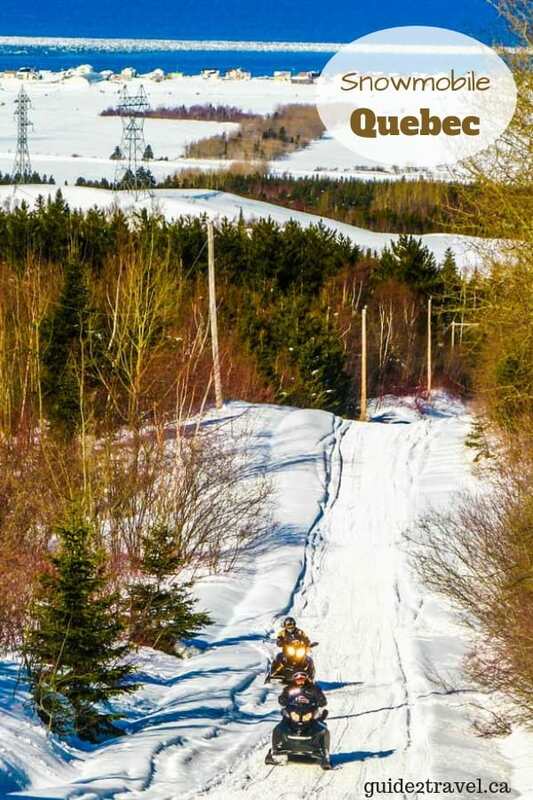 No matter which Quebec snowmobile trails you decide to ride, or which events to take in, one sure thing I can guarantee is the French Canada will welcome you! 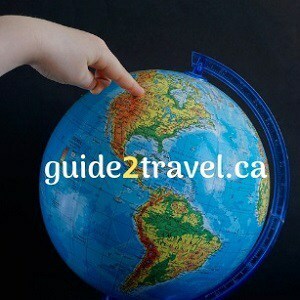 We were guests of Tourism Quebec, Tourism Gaspesie and the Eastern Townships on our visit to Quebec. Quebec is the ultimate winter destination in the great white north-Canada. Find a flavor of Europe along with skiing, dogsledding, winter carnival and more! Tips on how to survive your night at the Ice Hotel (Hôtel de Glace) or igloo adventure in Quebec City, Canada, and enjoy every minute! Stroll through the streets of historic Montreal, Quebec, the world’s 4th largest French speaking city, and check out Canada’s vibrant cultural capital. Where Can You Eat Bannock — a Traditional Indigenous Food — in Canada? Where can you eat bannock in Canada? If you’re not familiar with it, bannock is a traditional Indigenous food in North America. Here’s a review of a Regina, Saskatchewan., restaurant that serves it. 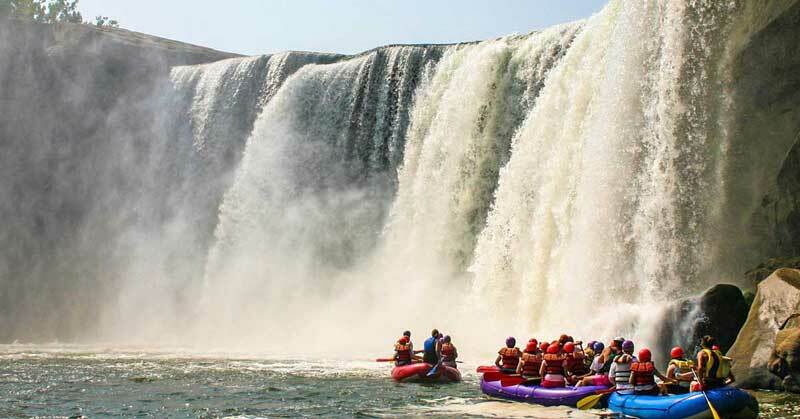 Visit Quebec City for the Grand Prix Cycliste de Québec as well as great cycling adventures, from beautiful bike tours to extreme mountain bike adventures. 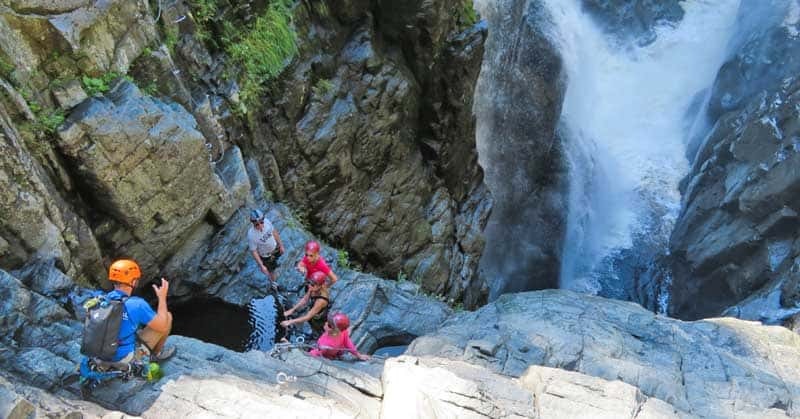 Get the ultimate adrenaline rush at the Canyon Sainte-Anne Via Ferrata where you go rock climbing above the rushing rapids of Sainte-Anne-du-Nord River. The photo in the header above was taken by Linda Aksomitis in the Gaspesie (Gaspé) region of Quebec, Canada.